We'd spent the night in a hotel in the city, at the edge of its Cathedral Quarter. 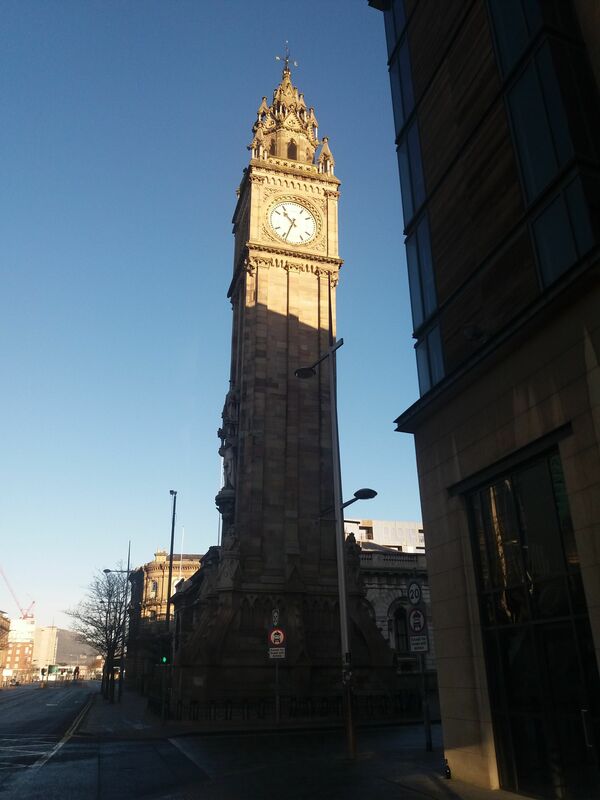 One of Belfast's most famous landmarks, the Albert Clock, stands just at the end of the block. I say stands, but 'leans' would be better: the structure - a memorial to Queen Victoria's consort Prince Albert - slumped to the side almost as soon as it was erected. 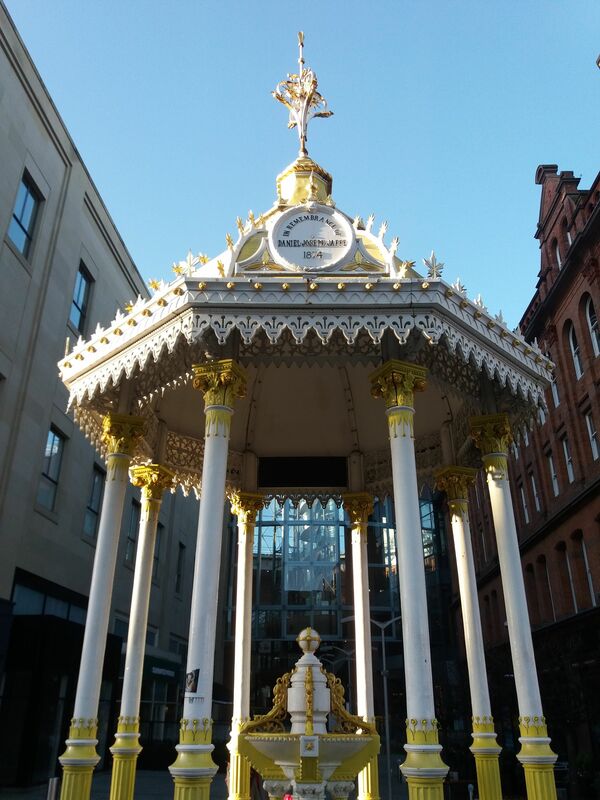 Belfast is built on a wet clay called sleech, and the foundations weren't up to the job. 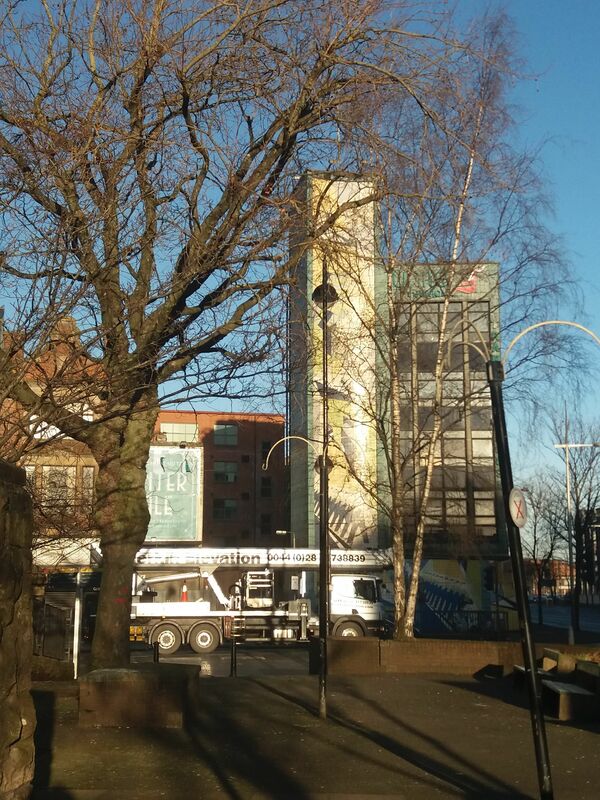 Across the road, Transport House is an ugly building with a kind of dignity and character of its own. 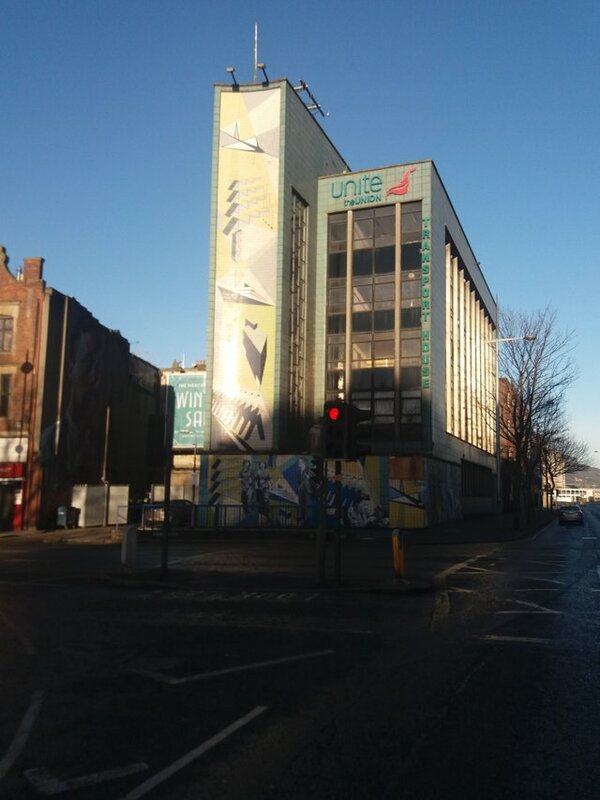 It's the headquarters of one of our largest trade unions - previously the Transport & General Workers Union - and the mural that rises on its side is one of the most distinctive pieces of public art in the city. A few steps away, the old National Bank building catches the sunlight from over the river. 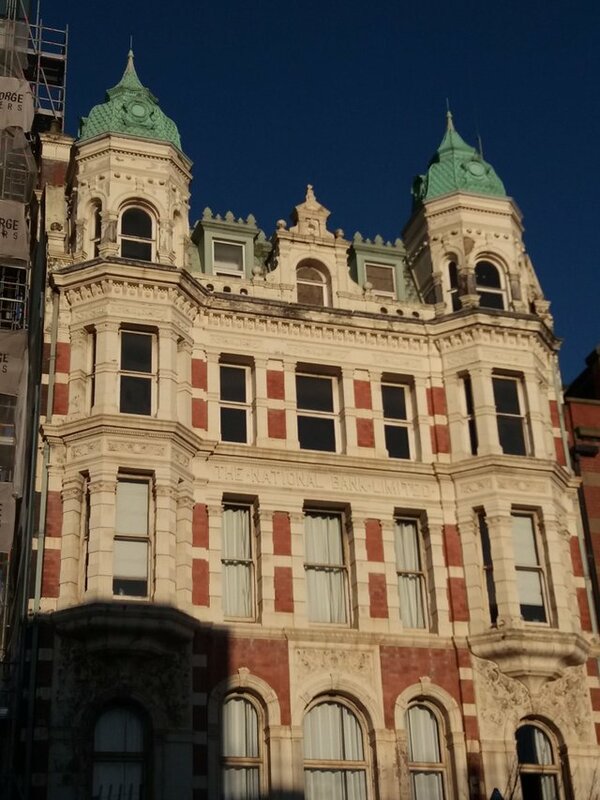 People don't often look up at its ornate facade, which I hope you agree is a shame. The Jaffe Fountain sits in the precincts of a modern shopping mall. It was placed here through the beneficence of Otto Jaffe, one time Lord Mayor of Belfast, in memory of his father, a linen merchant and pillar of the 19th century Jewish community here, moved to a suburban park in the 1930s, and restored to (almost) its original site in 2008. 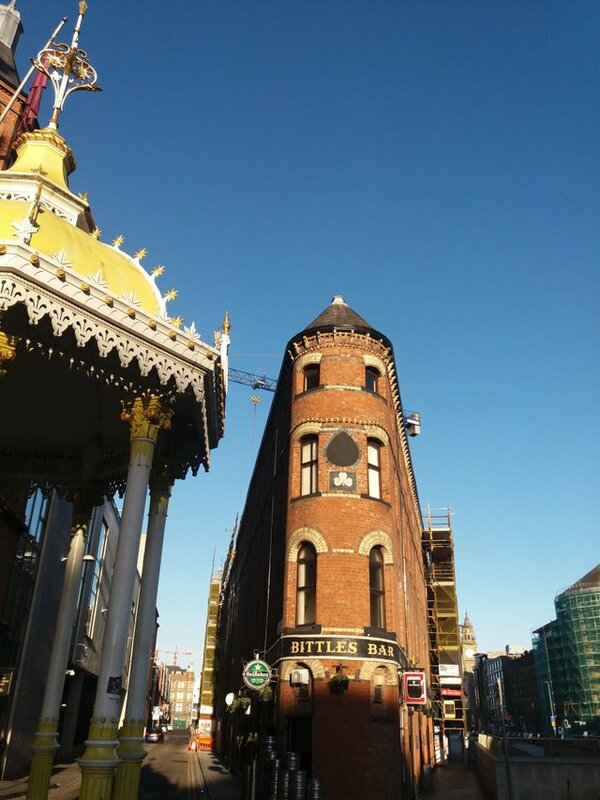 Beside the Fountain, and providing a different kind of liquid refreshment, is the iconic flatiron-profile of Bittles Bar. It's closed at this hour on a Sunday morning, of course, but maybe we'll meet here later for a pint? Best part during mornings (and evenings for that matter) are in my opinion when the sun creates magic like the first photo, as the upper part of the tower is covered in early day light while the rest is still waking up in its shadow. We're planning a first Belfast Steemit meeting possibly this weekend if you're interested @martinmooney or anyone else? Absolutely - keep us informed!